My Dogs Love Me: Run Free, Our Beloved China. Run Free, Our Beloved China. Sorry I wasn't able to come to your blogs these past couple of days. Last Saturday, June 15, 2013, we received the news that China had passed away at 5:30 am in the morning. This was my last picture of him. I miss him badly. He had Erlichia and I was confident that he would survive the the confinement because when we took him to the vet, he was still able to stand and he even drank water before we left. The vet even said that he might be dismissed the next day- as soon as he's replenished his fluids. However, that night, the veterinarian called us to say that his condition had gotten worst and she was just preparing our minds for what may happen. We still don't know the details because this was the vet who I disliked and I just feel awful because I didn't give him the proper burial myself and I wasn't there when it happened. Even when the vet said we did our best to save him, I still blame myself for what happened to him. What if the reason his body gave up was because I wasn't there? What if his body gave up because his pack brothers weren't there? China was a fighter and he battled Parvo with PJ without veterinary care! Is it my fault I decided to take him to the vet? Is it my fault that I allowed myself to entrust his life to the vet I disliked so much? Was it wrong for the vet to inject him with a heart-rate-increasing medicine when he was in a weakened state? Was this the reason why his body couldn't take the stress? We're so sorry about China. I can understand all the questions you have running through your mind right now. Sending you lots of hugs. Take care. So sorry to hear about China. It is hard enough losing your little fur buddy, without having the added questions that you may never have answers to. I know you are hurting, but please do not blame yourself, hard as it may be, you did everything you could for China and he will always love you for that. If it was his time, it was his time, regardless the circumstances. Take peace that he is running free and not sick anymore. Godspeed to you and your family. Haopee, we are so sorry to hear about China's passing. Please, please, please do not blame yourself, or question what you did. China knows that you loved him dearly, and you will see him again someday. Hugs, purrs and prayers to you, dear friend. We are so sorry to read about China. We know you did everything for the right reasons so don't be too hard on yourself. It was his time. We send love and hugs and we know China will be missed very much. Our thoughts and prayers are with you. So sorry about China. You cannot beat yourself up with Whatifs. You did your best and it was just his time to cross the bridge. We're so sad for you about China. Don't beat yourself up. Even vets we don't like usually try everything for an animal. It's always sad to lose a pet and we all feel guilty. Oh Haopee. I'm so, so sorry. Please don't blame yourself for China's demise. Vets are there to help and heal. Sometimes there's just nothing we can do. Feel our paws and arms around you in comfort. Your heart is broken and the loss is so great it is natural to try to find a place for blame. But do not do that to yourself, the questions you ask have no answers and China would not want you to suffer in such anguish. We know precious China is restored to full vitality and runs happily over the Rainbow Bridge. He will be waiting, tail wagging to greet you when it is your time. We pray China--and you--both know peace. Thank you so much, everyone. I've been beating myself about it since I heard the news. I do pray that he is in a better tick-free place. I am sure he wouldn't need to have all four paws in the air because he'd be able to run as fast the the long legged dogs. I'm so terribly sorry to hear the news of China's crossing the Rainbow Bridge. Don't blame yourself. China was needed at the Bridge and answered the call. There was a job that only he could do there. Keep all the good memories safely tucked away in your heart. Oh Haopee, we are so very very sorry to hear about the loss of your beloved China. Please don't try to second guess yourself. You loved China with all the love that is humanly possible - and China knew it too, we are sure of it! China will be waiting over the RB and will greet you lovingly someday when the time is right. Until then, we send healing purrs to you. I am very sorry about China too. May he rest in peace and may your hearts heal. So sorry to hear about China. We always blame ourselves when something happens to our babies but you loved him and cared for him which is the most important thing. I do know what you mean though, we had a vet I disliked a few years ago and changed on a friends recommendation. Ask around people who have dogs and see if there is one that people like and trust. I'm realy sorry to hear about China's passing. 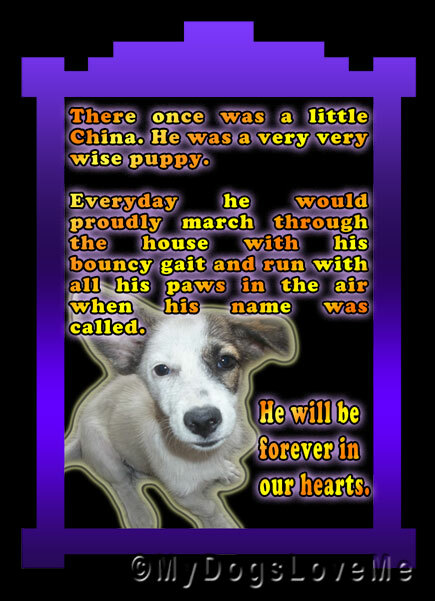 I am so sorry to hear about China, he knew he was so very very loved. He is running pain free at the bridge now. I'm so sorry to hear about China...and I do wish you wouldn't blame yourself. None of us knows the right thing to do when it comes to vet care because much of it is a guessing game. You do what you can, and you try your best. That's all that matters. My heart goes out to you at this difficult time. We are very very sorry for your loss. Please do not blame yourself for what had happened. He had a wonderful life. He'll be missed. I'm so sorry about China. I know how hard it is and how easy it is to second guess yourself. Don't blame yourself Haopee. You took very good care of him and he had a wonderful life because of you. Sending lots of thoughts and prayers your way. Oh, we're sorry we're late leaving condolences for China's loss. How sad! Hugs.